I hesitate to post this as not only is it not a good picture but you’re only seeing the tail end (ahem) of a brief encounter Saturday morning. 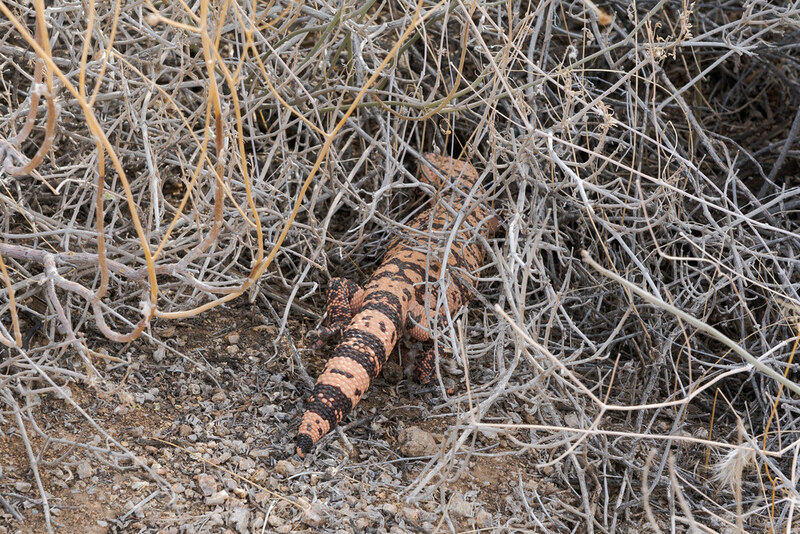 But this brief encounter already joins my pantheon of favorite hiking moments, as the one creature I wanted to see in Arizona above all others, but the one I knew was rare to see, was the Gila monster. I arrived at Brown’s Ranch before sunrise Saturday morning as I have many times the past couple of months, this section of McDowell Sonoran Preserve has been the place I’ve visited most frequently. I hoped to photograph Gambel’s quail up on the saguaros in the lovely morning light but I found something unexpected when I arrived at the trailhead: clouds. I’m used to clouds. I’m from Oregon. But I’ve gotten so used to blue skies here in the desert that I’ve only been checking temperatures before I hike, not cloud cover. The clouds were thick (for Arizona, not for Oregon), thick enough to snuff out the morning light, and that meant a change of plans. Instead of looking for wildlife along familiar trails, I immediately headed out eastward on the Chuckwagon Trail. I had hiked it the week before with the sun in my eyes so I took advantage of the cloud cover to shoot patterns in the plants and rocks along the trail and had a grand time. I wasn’t seeing much wildlife, not even a lizard, and jokingly thought to myself that I hadn’t been in Arizona long enough to know who to complain to about that. I hiked further on the trails this time, up to Cathedral Rock, and turned around to try some different trails on the route back. I packed up my telephoto lens as the sun was getting a bit bright, swapped my tripod for my hiking poles, and set off to explore. I didn’t make it very far. There it was crossing the trail in front of me, one of the most beautiful creatures I’ve ever seen, this Gila monster. As slowly as it walked – walked? waddled would be a better term – and as colorful as it was, it soon disappeared into the desert brush. I grabbed my little Sony out of my camera bag and got a quick picture before it was gone from sight, but there was no time to set the focus on its head. Then it was gone. We only shared a few seconds together but I’ll remember those seconds for a lifetime. I returned to Brown’s Ranch this morning but the clouds did not. I found my quail on a saguaro, and more besides. The desert is full of wonders, but this wonder, this monster, I hope to meet again. This entry was posted in Reptiles and tagged Arizona, Brown's Ranch, Cholla Mountain Loop Trail, desert, gila monster, lizard, McDowell Sonoran Preserve, Scottsdale, Sonoran Desert. Bookmark the permalink.